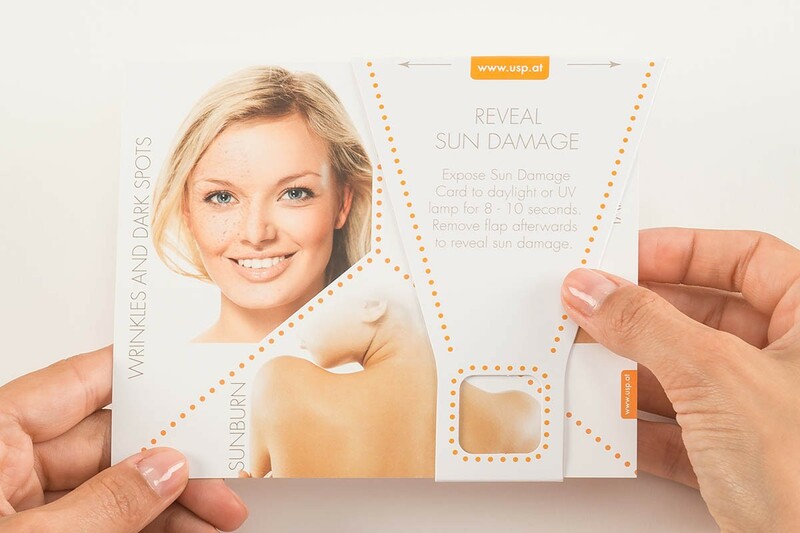 USP Solutions’ Sun Damage Dark Spots and Wrinkles Demo Tool is a reliable and easy-to-use test. It appeals to your consumers’ senses and shows the damaging effects of UV rays within seconds. 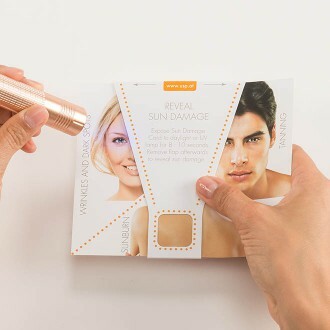 The Sun Damage Dark Spots and Wrinkles Demo Tool simulates the sun’s damaging impact on the skin. The card reacts to UV light. 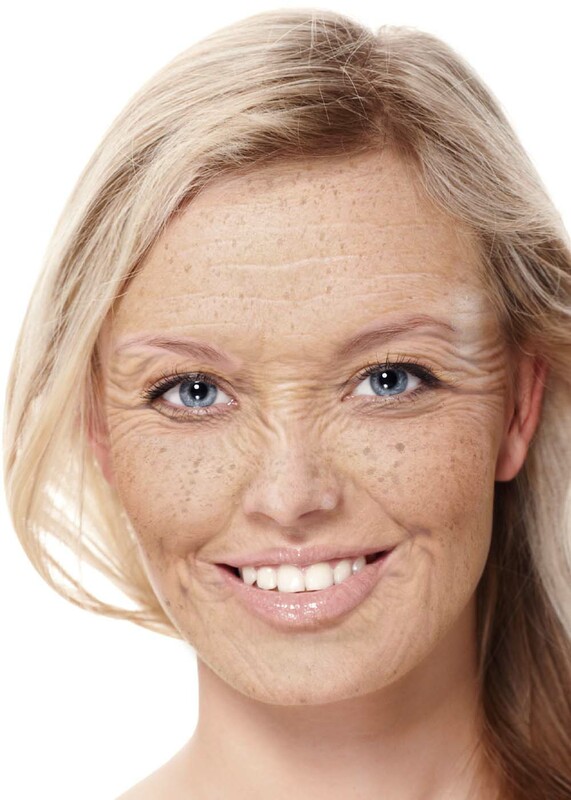 When exposed to sun or a UV lamp, the image of the beautiful girl shows wrinkles and dark spots. 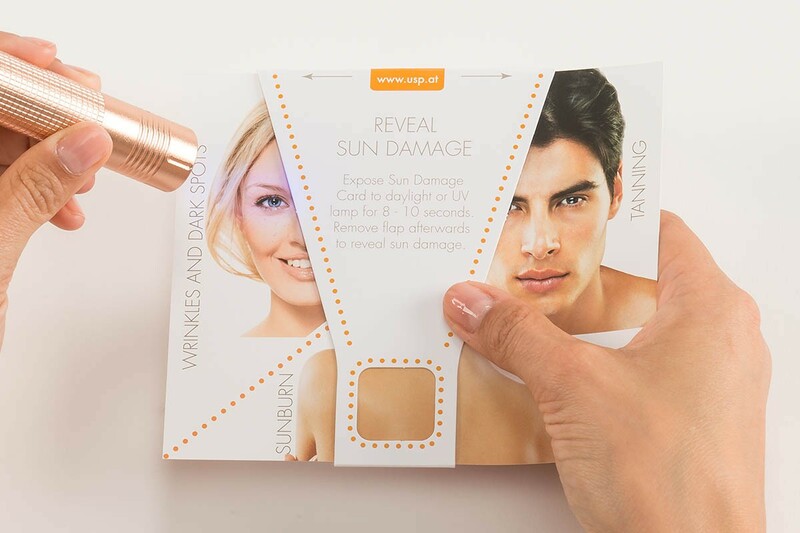 This dramatic test can be used to make your consumers aware of the necessity to protect their skin from harmful UV rays by using your UV protection products. Alternatively, it can be used with your SPF product to prove your product’s effectiveness against sun damage. 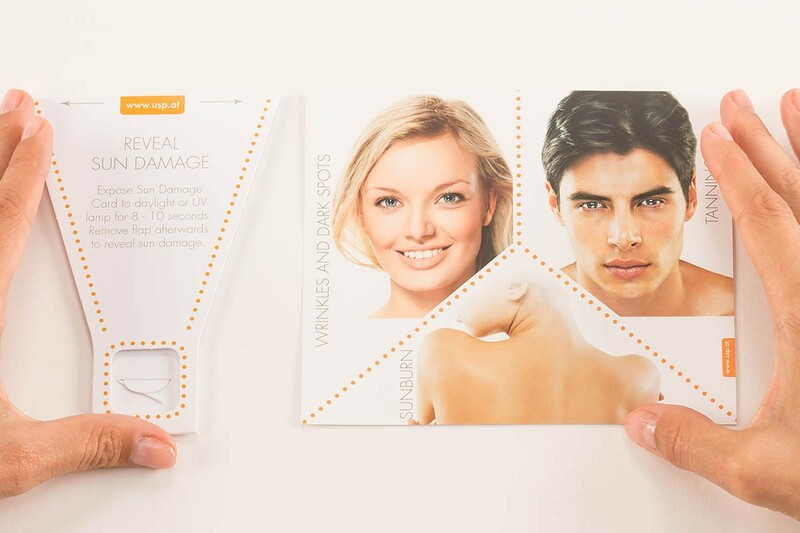 When consumers learn about the necessity to protect their skin, they experience an “A-ha” moment. This emotional experience is also referred to as “Beauty Moment of Truth”. Many consumers are unaware of how damaging UV rays can be. A sun burn is noticed right away, but wrinkles and dark spots only appear after years of unprotected UV exposure. 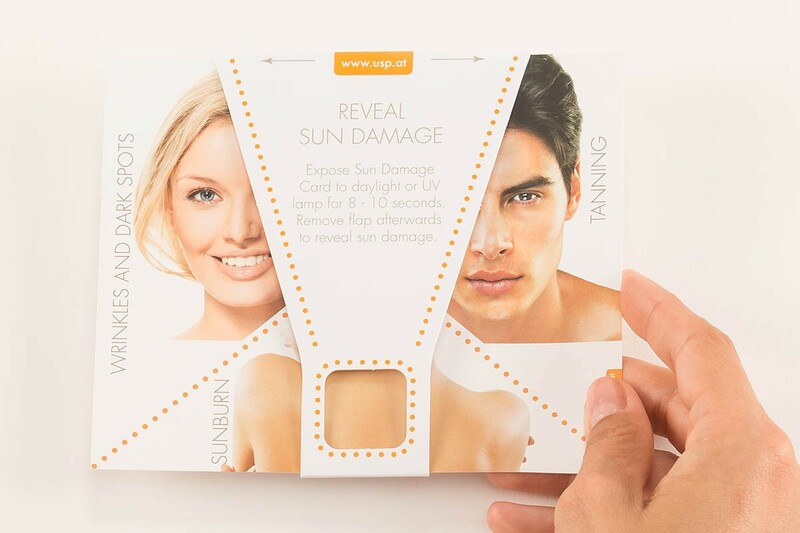 How do you, as a Marketing Executive, make the consumers aware of the need for sun protection. How do you guide consumers to the right product choice within your range and prove your product claim? In many countries consumers long for tanned skin, often unaware of the damaging effect UV rays have on the skin. In other countries consumers know about the danger and want to ensure that the product they purchase protects them well. What effects have UV rays to my skin? How well does the sunscreen work? We provide Marketing Executives with multisensory Brand Activation Tools which enable consumers to experience a brand throughout various channels. 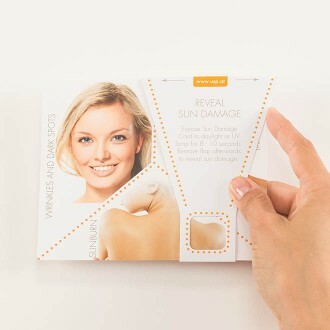 The USP Solutions Sun Damage Dark Spots and Wrinkles Demo Tool enables your cosmetics brand to design an emotionally engaging and tailor-made “Beauty Moment of Truth”. 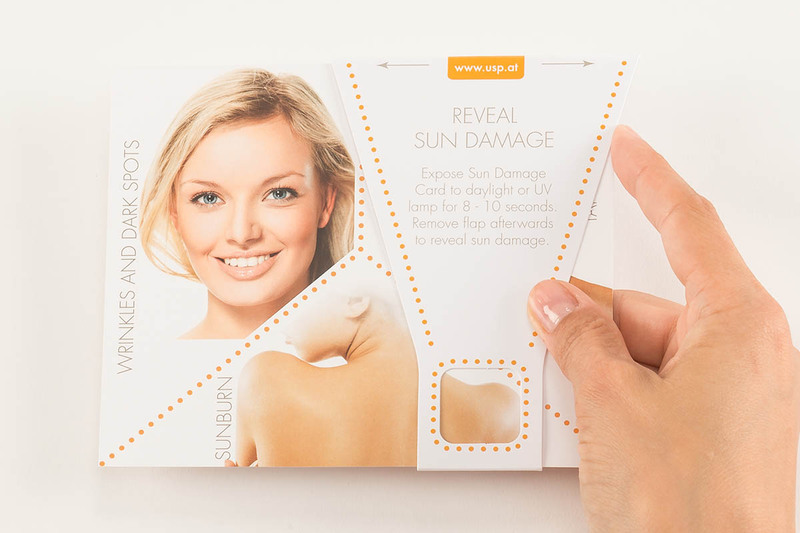 Visualize the damaging effects of UV rays in an impactful way. 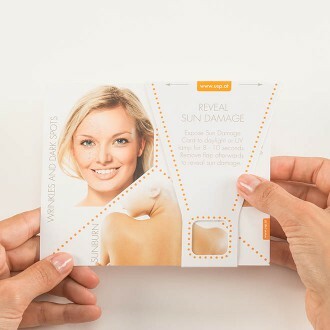 We can easily customize Sun Damage- Dark Spots and Wrinkles Demo Tool and adjust size, shape, material, printing effects and more – so the tool perfectly reflects the uniqueness of your brand.